Welcome to the most beautiful Greek island. Santorini is a dream you can have with eyes wide open. Let yourself calm by merely looking at Caldera’s deep blue. Climb up the volcano’s top. Lose your senses through the magic of the sunset. Explore the island’s superb beaches with the unique black sand. Walk up and down the steep rocks. Touch the edges of the white houses that shimmer in the light of the Aegean sea. 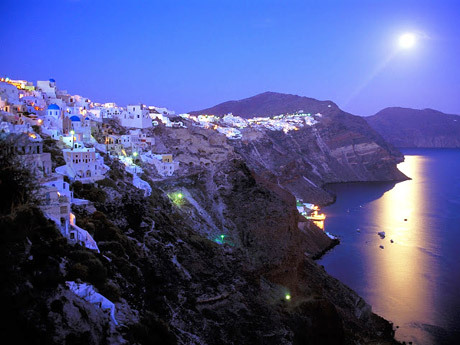 It is no coincidence that The BBC has classified Santorini as the most beautiful island in the world. In Santorini Greek Guide you will find all the necessary information on hotels, villas and rooms to let, private mansions and villas for rent, restaurants, cafés, bars, car and bike rental agencies, shops, beaches, sights and archaeological sites in Santorini.